Honey Bee-trice is super sweet!Colored her up using Copics and the blender pen on textured cardstock that someone gave me a while back. Followed a sketch from Mojo Monday, and the papers are Cosmo Cricket Circa 1934 mini deck. Don't you just love the nostalgic look of these papers? think i'll be using them more often! :D Sentiment is from Hero Arts. Join our current ATS Wednesday challenge... it's an easy one... ANYTHING GOES! and you may be the lucky winner of 5 C.C. Digi images!! Please stop by the challenge blog to see more from the team! and check out the NEW Sugarplums Beach Kit here! This is just the cutest!! Love it! O this looks like a fun technique Mimi!! Totally cute little bee and love the layers you created! this is super adorable! Very adorable! Great coloring and layout! 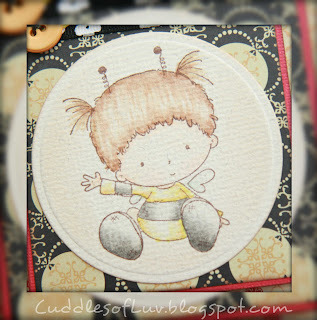 such a cute image you used for your card! love it! gotta love the layout too! fabulous DP too! hope you are having a good week!